(Scottish term) as for chief clerk; makes surprise checks of work and keeps special ledgers, e.g. profit and loss account; sometimes responsible for daily balances of bank cashiers (939). (ii) acts as representative of a bank, in place where no branch of that bank exists, or where, by virtue of his knowledge of local financial conditions, he can advise the branch manager; obsolescent. receives small deposits and pays out under certain conditions, as representative of a savings bank (not P.O.) 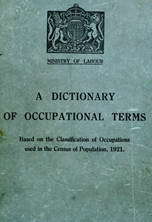 in outlying areas; usually a part-time occupation; obsolescent. a bank cashier (939) (q.v.) who normally does work of cashier and is also responsible for daily balances of the cashiers under him, and for the cash in the strong room. is in charge of all clerical work in large branch of a bank, or in a section at head office, e.g. securities, ledgers, correspondence; apportions duties, checks work periodically and is generally responsible for manager's instructions being carried out; usually deals with enquiries from public. travels from branch to branch of a banking company, checking and auditing ledgers, cash balances, etc., and inspecting work in general. in charge of business of bank, or branch; interviews clients; conducts correspondence; arranges transactions; controls staff. is responsible at head office for management of whole banking concern and its branches, and ensures that policy of directors is carried out; controls staff appointments and promotions.